Cookies are such a simple pleasure, don't you think? They're quick and easy, they smell heavenly while they're baking, and they make the whole house feel warm and inviting. Plus, they ALWAYS hit the spot with a nice tall glass of ice cold milk. Christmas would simply NOT be the same without them! I found this recipe and it looked simple and quick to throw together, (which is a MUST during the busy holiday season), so I gave it a try. Joshua and Denny were my testers and they both gave it a big "thumbs up"! It's no surprise, though, because seriously, can you ever go wrong with a really good basic chocolate cookie? I think not. 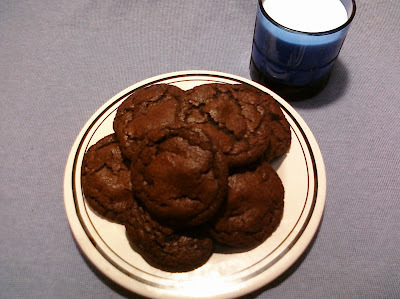 This is now my "go to" chocolate cookie recipe. They're rich and fudgy and they taste like brownies in the form of a thin chewy cookie. What's not to love? So, whether you're baking for a holiday cookie swap or an after school snack, these cookies should definitely be in your repertoire! In a large bowl, cream together butter and sugar until fluffy. Beat in eggs one at a time, then stir in the vanilla. In a separate bowl, combine flour, cocoa, baking soda, and salt. Stir into the creamed mixture until just blended. Mix in chocolate chips. Drop by tablespoonfuls onto ungreased cookie sheets. Bake for 8 to 10 minutes. Don't over bake! You want them to be soft and chewy, so under bake them just slightly. Allow to set on cookie sheets before removing to a cool flat surface. Whenever I bake cookies, I ALWAYS use parchment paper on an airbake cookie sheet . (you know, the cookie sheets that have the pocket of air inside?) Seriously, I can't even remember the last time I burned a cookie or had one stick to the pan. As soon as you take the cookies out of the oven, you just slide the whole sheet of parchment right off the pan onto the table. You barely even need a spatula! Then you can slide the next sheet of parchment (full of unbaked cookies) right onto the sheet and into the oven it goes. While it's baking, you can get the next sheet of parchment ready. Easy, right? You can knock out a batch of cookies in no time. To make perfectly round cookies, let the cookie dough chill in the fridge for a little while, just until it begins to firm up, then roll tablespoonfuls into balls. Bake them up as usual, and you'll wind up with perfectly perfect thin round cookies! Oh! Then you could make ice cream sandwiches with them! Brilliant.